Institute striker Darren McFadden will miss tomorrow’s clash at Cliftonville. On the plus side, fellow centre-forward Robbie Hume has overcome his hamstring problem and is fit to play. 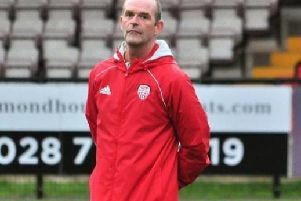 The Stute boss spoke to Sentinel Sport’s Editor Kevin McLaughlin after training last night.